North Carolina’s Outer Banks has long been known for its spectacular fishing. Red drum, bluefish, striped bass, flounder and king mackerel are just some of the prized fishes sought by anglers young and old. 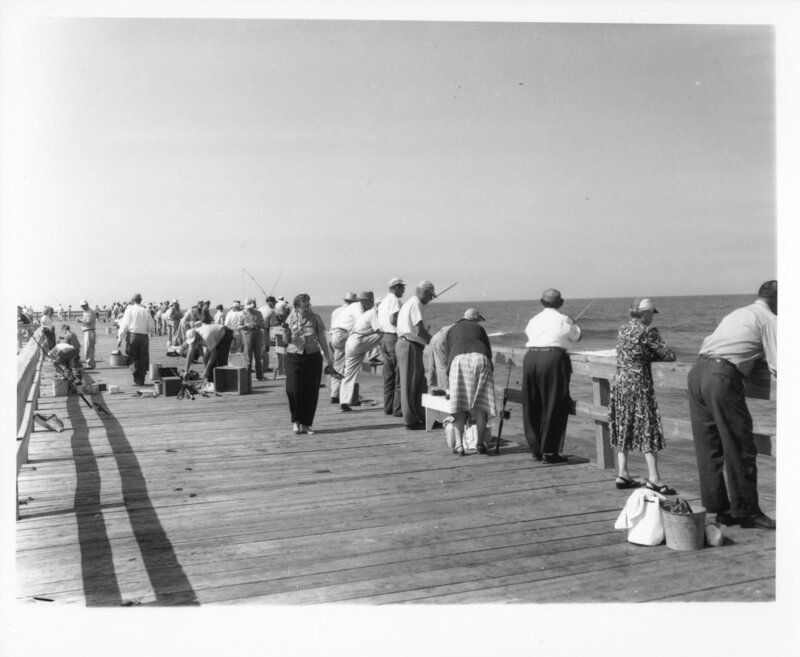 Fishing on the banks was forever changed when the first fishing pier – Jennette’s Pier – was opened in Nags Head back in 1939. Warren H. Jennette Sr. and the Jennette Brothers acquired the property in South Nags Head and began construction on May 22, 1939. The beachfront site at Whalebone Junction was the former “Transient Camp,” built in 1933 by the U.S. Civil Works Administration to house some of the 1,500 workers that constructed protective sand dunes from Corolla to Ocracoke. The old camp’s numerous cabins were renovated and made convenient housing for fisherman who traveled great distances to fish on the pier. From the deck of the pier anglers cast their lines for more than sixty years, though numerous hurricanes and nor’easters battered the structure and caused it to be repaired and rebuilt from time to time. The pier house was reconstructed on several occasions, later becoming a much larger facility with a restaurant, tackle shop, and arcade. Eventually, the Jennette family sold their interest in the pier. Years later in 2003, the pier was sold again to the North Carolina Aquarium Society so that it might be developed into an educational outpost for the Aquarium. But in September 2003, Hurricane Isabel swept the North Carolina coast, knocking down about 540 feet of Jennette’s Pier and practically shutting down an Outer Banks institution. It then became time to rethink the fishing pier concept, with the Aquariums taking the lead to rebuild Jennette’s as an all-concrete, 1,000-foot-long, educational ocean pier. On May 22, 2009, Governor Beverly Perdue led a gathering of legislators, local officials, and Aquarium leaders for a “sand-breaking” on the site of the new $25 million Jennette’s Pier, seventy years to the day from the first construction. On May 21, 2011, Gov. Perdue christened the new pier while thousands of people looked on and it officially became the fourth facility in the North Carolina Aquariums division of the N.C. Department of Environment and Natural Resources. Since that time, the Aquariums division has been moved to the N.C. Department of Natural and Cultural Resources.